Burushaski has a number of unaspirated and aspirated voiceless consonants which are also present in Urdu. In addition, it also has unaspirated and aspirated voiceless dental affricates [c]/[cʰ] and voiceless retroflex consonants [c̣]/[c̣ʰ] which are absent in Urdu. Consistent with the Urdu alphabet, this study proposes to use digraphs for all aspirated consonants (See table below for illustration; U = Urdu, B = Burushaski). The proposed modification will remove the symbols used for [ċh] (Arabic letter hah with four dots or numeral 4 underneath) and [ch] (Arabic letter swad with three dots above) by BRA since these are redundant being the aspirated counterparts of [c̣] and [c] (respectively). 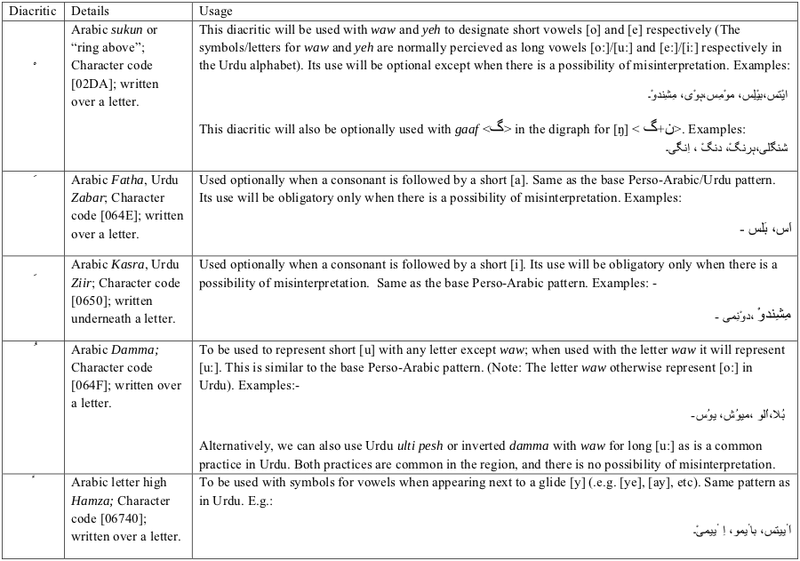 This study proposed to use the following diacritics in the writing system (see table below). The justification for doing this is that their use is very common in both Urdu and Perso-Arabic script and a number of its modifications in all the Burushaski-speaking regions.